Choline is a water-soluble organic compound that is classified as an essential nutrient for humans (Higdon and Drake 2008; PDR 2008; Swan and Zeisel 2000). This natural amine is involved in a number of important functions, including its use in the synthesis of phospholipids and other structural components of cell membranes, as a precursor for the important neurotransmitter acetylcholine, and as a major source of methyl groups (Higdon and Drake 2008). While historically choline had been grouped within the Vitamin B complex (vitamin Bp), it is not technically a vitamin (Higdon and Drake 2008). Vitamins are organic (carbon-containing) nutrients obtained through the diet and essential in small amounts for normal metabolic reactions. While choline is essential in small amounts for humans, it can be synthesized in the human body from other starting materials, rather than being obtained through the diet. However, choline often cannot be manufactured at sufficient rates to meet the demands of the body, and thus must be consumed in the diet for optimal health. The Food and Nutrition Board of the Institute of Medicine of the National Academy of Sciences established an Adequate Intake level (AI) of 550 milligrams per day for adult males and 425 milligrams per day for adult females (450 mg/day for pregnant females and 550 mg/day for those breast-feeding) (Higdon and Drake 2008). Although dietary intake often is necessary for humans, choline is a ubiquitous component of cell membranes and common in foods, and thus dietary deficiency is rare (Bender and Bender 2005). Nonetheless, the recognition, through scientific inquiry, of the role of choline has had important implications, from making it an additive in those infant formulas not made with cow's milk to supplementing the mixtures provided intravenously to hospital patients, who otherwise might develop fat accumulation in their livers and death of liver cells (Swan and Zeisel 2004). Too much choline also can have deleterious effects, whether resulting from overuse of supplements or from contributing to a genetic condition that does not allow the choline metabolic product trimethylamine to be properly broken down (Hidgon and Drake 2008; Swan and Zeisel 2000). Choline is a quaternary saturated amine with the chemical formula C5H14NO+, or (CH3)3N+CH2CH2OHX−, where X− is a counterion such as chloride, hydroxide, or tartrate. (Amines are organic compounds and functional groups that contain a basic nitrogen atom with a lone pair.) Choline is a derivative of the amino acid serine (Bender and Bender 2005), but is not a protein or amino acid (Swan and Zeisel 2000). Choline was discovered by Andreas Strecker in 1864, and chemically synthesized in 1866. In the human body, it can be manufactured in the liver. Humans synthesize choline in small amounts by conversion of phosphatidylethanolamine (a phospholipid) to phosphatidylcholine, involving three methylation reactions, each using the compound S-adenosyl methionine (SAM) as a methyl group donor (Higdon and Drake 2008). Phosphatidylcholine can then be metabolized to provide choline. Choline is used in the synthesis of phosphatidylcholine, which is also known popularly as lecithin (although lecithin technically refers to a broader group of substances, one of which is phosphatidylcholine). Lecithin is common in health food stores and the lecithin from peanuts and soya beans is used as an emulsifying agent (Bender and Bender 2005; Swan and Zeisel 2000). Choline chloride, in mixture with urea, is used as a solvent (DES) and the salicylate salt is used topically for pain relief of aphthous ulcers. Choline hydroxide is one of the class of phase transfer catalysts, which are used to carry the hydroxide ion into organic systems. It is far and away the least costly phase transfer catalyst, and gets a lot of use in stripping photoresists in printed circuit board production. Choline hydroxide is not completely stable and it spontaneously, slowly breaks down to release trimethylamine. It is a strong base. In 1998, choline was classified as an essential nutrient by the Food and Nutrition Board (FNB) of the Institute of Medicine (U.S.) (Higdon and Drake 2008). While this board found insufficient scientific evidence to calculate a RDA (Recommended Daily Allowance, now Reference Daily Intake), they did set an Adequate Intake level (AI) (Higdon and Drake 2008). This ranged from 125 milligrams per day for infants 0 to 6 months of age, to 550 milligrams per day for adolescent (14 to 18 years old) and adult males (19 and above) and breastfeeding females (Higdon and Drake 2008). The level for adult females was set at 425 milligrams per day. The FNB also established the tolerable upper intake level (UL) for choline at 3.5 grams per day for adults, based primarily on preventing hypotension (low blood pressure), as well as the fishy body order when it is broken down by bacteria in the large intestine, resulting in increased excretion of trimethylamine (Hidgon and Drake 2008; Swan and Zeisel 2000). The foods richest in phosphatidylcholine—the major delivery form of choline—are egg yolks, soy, and cooked beef, chicken, veal, and turkey livers. Many foods contain trace amounts of free choline, even iceberg lettuce. To what extent these trace forms are usable by human digestion is still debated. In 2004, the USDA released its first database of the choline content in common foods (Howe et al. 2004). The most often available choline dietary supplement is lecithin, derived from soy or egg yolks, often used as a food additive. Phosphatidylcholine (often used synonymously with lecithin, although it is just one of the compounds classified as lecithin) is also available as a supplement, in pill or powder form. Supplementary choline is also available as choline chloride, which comes as a liquid due to its hydrophilic properties. Choline chloride is sometimes preferred as a supplement because phosphatidylcholine can have gastrointestinal side effects. 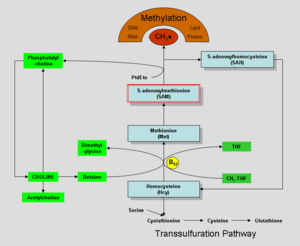 Choline and its metabolites are needed for three main physiological purposes: Structural integrity and signaling roles for cell membranes, cholinergic neurotransmission (acetylcholine synthesis), and as a major source for methyl groups via its metabolite. Choline also is used for lipid transport and metabolism. Choline is involved in the synthesis of phospholipids phosphatidylcholine and sphingomyelin, which are structural components of cell membranes (Higdon and Drake 2008). These two choline-containing phospholipids also are precursors for intracellular messenger molecules (diacyglycerol and ceramide); two other choline metabolites, sphingophosphorylcholine and platelet activating factor (PAF), also are known as cell-signaling molecules (Higdon and Drake 2008). Choline is a precursor for synthesis of acetylcholine, which is a key neurotransmitter. A derivative of both choline and acetic acid, acetylcholine is active both at the synapses between neurons and in the stimulation of muscle cells at the neuromuscular junction, and also stimulates secretion of glands. Choline may be oxidized to form betaine, which is a source of methyl groups (a carbon attached to three hydrogen atoms) for methylation reactions (Higdon and Drake 2008). Betaine (trimethylglycine) participates in the S-adenosylmethionine synthesis pathways. The conversion of homocysteine to methionine may utilize methyl groups from betaine, which is important health-wise since elevated levels of homocysteine in the blood is associated with increased risk of cardiovascular disease (Higdon and Drake 2008). Choline also is important for lipid transport and metabolism, with phosphatidylcholine a required component of very low density lipoproteins (VLDL), used for transport of fat and cholesterol through the blood to tissues requiring them (Higdon and Drake 2008). Without sufficient phosphatidylcholine, cholesterol and fat accumulate within the liver (Higdon and Drake 2008). Choline is a precursor to trimethylamine, a compound with a fishy odor. When choline is metabolized by the body, it may form trimethylamine. Hence, when large amounts of choline are taken, the person may suffer from a fishy body odor. Furthermore, some persons are not able to break down trimethylamine due to a genetic disorder. Persons suffering from this disorder, called trimethylaminuria, may suffer from a strong fishy or otherwise unpleasant body odor due to the body's release of odorous trimethylamine. A body odor will occur even on a normal diet, in other words, one that is not particularly high in choline. Persons with trimethylaminuria are advised to restrict the intake of foods high in choline; this may help to reduce the sufferer's body odor. Choline, when oxidized to form betaine, is involved in the providing a methyl group for conversion of homocysteine to methionine by the enzyme betaine-homocysteine methyltransferase. Since research evidence indicates that even moderately elevated homosysteine levels in the blood increase the risk of cardiovascular disease, it would seem that dietary choline may be important for decreasing the risk of cardiovascular disease; however, research evidence of such a link is lacking (Higdon and Drake 2008). Lakhan and Vieira (2008) link choline deficiency to bipolar disorder and report efficacy in lecithin supplementation based on a double-blind, placebo controlled trial. Choline deficiency in rats is correlated with increased incidence of liver cancer and increased sensitivity to carcinogenic chemicals (Higdon and Drake 2008). Increased choline dietary intake in rats has been shown to diminish the severity of memory deficits in aged rats (Higdon and Drake 2008). Experiments removing choline from the diet of normal men resulted in livers that did not work properly and leaked critical components of the liver into the blood, indicating that liver cells were dying when deprived of choline (Swan and Zeisel 2000). Choline supplements may be taken for possible prevention of heart disease. Choline supplements also are taken often as a form of "smart drug" or nootropic, due to the role that the neurotransmitter acetylcholine plays in various cognition systems within the brain. Research suggests that memory, intelligence, and mood are mediated at least in part by acetylcholine metabolism in the brain. The choline compound's quaternary amine renders it lipid insoluble, which might suggest it would be unable to cross the blood-brain barrier. However, despite choline's lipid insolubility, a choline transporter exists that allows transport across the blood-brain barrier. The efficacy of these supplements in enhancing cognitive abilities is a topic of continuing debate. Some people who practice lucid dreaming use Galantamine with choline bitartrate or Alpha GPC to increase their odds of having a lucid dream. Acetylcholine precursors such as choline are believed to work synergistically with Galantamine to help improve memory and the symptoms of Alzheimer's Disease (AD). The Food and Drug Administration (FDA) requires that infant formula that is not made with cow's milk must contain choline (Stehlin 1996). Due to its role in lipid metabolism, choline has also found its way into nutritional supplements that claim to reduce body fat; but there is little or no evidence to prove that it has any effect on reducing excess body fat or that taking high amounts of choline will increase the rate at which fat is metabolized. Higdon, J., and V. J. Drake. 2008. Micronutrient Research for Optimum Health: Choline. Linus Pauling Institute (Oregon State University). Retrieved July 17, 2008. Howe, J.C., J.R. Williams, J. Holden, S.H. Zeisel, and M.-H. Mar. 2005. USDA Database for the Choline Content of Common Foods: 2004. U.S. Department of Agriculture, Agricultural Research Service. Retrieved July 17, 2008. Lakhan, S.E., and K.F. Vieira. 2008. Nutritional therapies for mental disorders. Nutrition Journal 7(2). Retrieved July 17, 2008. Physicians Desk Reference (PDR). 2008. Choline. PDRHealth. Retrieved July 17, 2008. Stehlin, I.B. Infant formula: Second best but good enough. U.S. Food and Drug Administration. Retrieved July 17, 2008. Swan, N., and S. Zeisel. 2000. An Interview with Professor Steven Zeisel, Department of Nutrition, University of North Carolina, School of Public Health. Radio National: The Health Report April 17, 2000. Retrieved July 17, 2008. This page was last modified on 21 July 2008, at 12:53.